Take mealtime to the next level with our Chimichurri Steak and Cheese Sandwich. 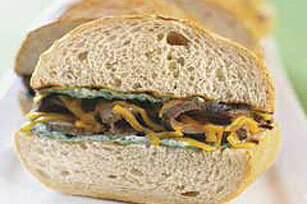 Find out how to make this easy Chimichurri Steak and Cheese Sandwich today. Mix mayo, parsley and garlic. Spread mixture evenly on inside of both bread halves. Preheat grill to hot heat. Grill steak 3 min. on each side or until desired doneness. Remove from grill; cover loosely with foil to keep warm. Let stand 5 min. Cut steak into thin slices. Meanwhile, toast bread halves on grill, turning occasionally to avoid burning bread. Place bread on platter; top bottom half with steak strips. Sprinkle with cheese. Top with remaining bread half. Cut into 6 pieces. Prepare as directed, using KRAFT Light Mayo Reduced Fat Mayonnaise and KRAFT 2% Milk Shredded Reduced Fat Cheddar Cheese. Substitute grilled chicken for steak, if desired. To save time, cut bread and spread with chimichurri mayo mixture; cover. Keep refrigerated until ready to grill.